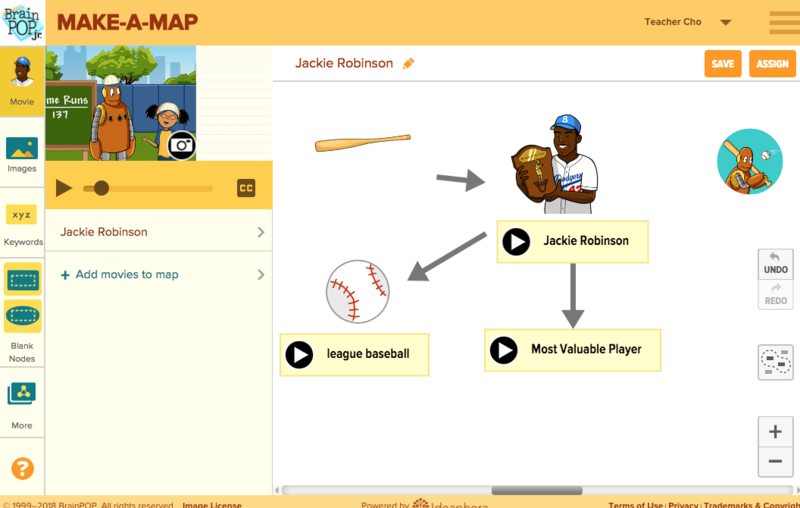 Make-a-Map, BrainPOP’s concept mapping tool, accompanies every BrainPOP Jr. topic. Make-a-Map invites students to make meaningful connections between concepts and reinforce knowledge using BrainPOP ELL images, keywords, and movie clips. Make-a-Map supports students by prompting them to demonstrate specific relationships between concepts from the featured movie. BrainPOP Educators provides teaching resources to help you get started using Make-a-Map in your classroom, including a printable Step Guide. Can students save maps to return to later? Yes. Students with My BrainPOP student accounts can save maps and access them later by visiting their Timeline, clicking View for the map, then clicking Edit. Students without My BrainPOP accounts cannot save their work, but they can print the maps they create. Can I assign a template map? Yes. If you have a My BrainPOP educator account, you can assign a template map by selecting the desired map template and clicking Assign. Yes. Teachers with My BrainPOP educator accounts can export maps by clicking Download below the map you are viewing. If you do not have My BrainPOP, you can print the maps you create instead. Can I access Make-a-Map on my phone? No. Make-a-Map is not currently available for phones. You can access Make-a-Map on desktops and tablets.